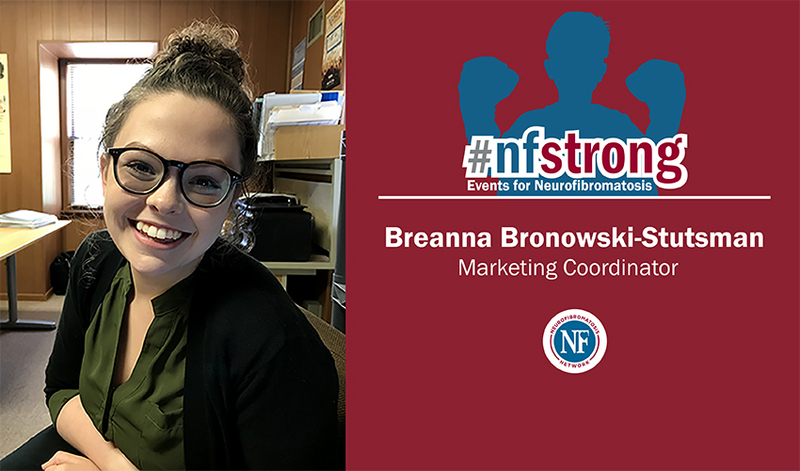 My name is Breanna Bronowski-Stutsman and I am the new Marketing Coordinator for the Neurofibromatosis (NF) Network. I will be working in the events department alongside Yvonne Glass to continue the great work already being done within our NF communities nationwide. In addition to planning #NFStrong events, I will conduct the advertising and marketing process as well. Currently, I am pursuing my degree in Graphic Design, and have had experience working with ALS walks in my own local community. It is amazing what people are capable of, especially when we are all working towards the same goal. I love people, the connections and the relationships that can be made. These people and communities are what inspires me to do the work that I do. There are so many wonderful people in the NF community who all have their own unique story to tell. These inspiring stories deserve to be heard, and I want to do what I can to help. I aspire for my role at the NF Network to be a key part in continuing to grow not only our events, but to also reach a larger audience and forge even stronger bonds. I am eager for our #NFStrong events in Memphis and Orlando later this year, and I am excited for my future at the NF Network!